2017-03-13a I just spent about an hour in my hammock trying out the quilt/liner. I don't know the actual temperature in the garage but am guessing it is about 42 as the outside temperature is 35. I started out with just my DIY down underquilt and the quilt/liner and my Ozark Trail 40F Climatech Mummy Sleeping Bag in my ENO DoubleNest hammock. I was actually quite comfortable, especially my topside. But my back and shoulders were on the verge of being chilly. So I added my Therm-a-Rest Trail Scout sleeping pad. That combination was just plain warm and cozy, and comfortable too. The Trail Scout sleeping pad is quite soft and pliable and conforms well to the hammock and body. I'm tempted to say I like the lay better with it than without it. Will this setup work at 30 degrees? Guess I'll have to wait for the temperature to drop to find out. 2017-03-13 I had another new idea the other day. Actually it wasn't really my idea. When my two son's and I were on our Boundary Waters trip last fall it was chilly at night. Charles and I only had light weight Ozark Trail 40F Climatech Mummy Sleeping Bags. But I had brought along two Costco Packable Down Throws as well so we could throw those on top if needed. On the third and coolest night he got the bright idea of putting the throw inside of the sleeping bag instead of on top like a blanket and said it was considerably warmer. That got me thinking about how to keep warm in the garage with my grandson and friend this past Friday night. So I decided to turn one of those Costco Down Throws into a light weight top quilt or more realistically a sleeping bag liner. To do that I added a bunch of Dritz Plastic Snap Fasteners in strategic locations along the one of the shorter ends of the throw making a sort of foot box. I actually used it in the Snugpak Cocoon, along with my DIY down underquilt also made from a Costco Down Throw, highly modified. It seemed to work well. Shot of the foot box on the end of the DIY Top Quilt/Bag Liner. DIY Top Quilt/Bag Liner made by adding plastic snap fasteners to one of the short sites to make a foot box. I made it with considerable overlap so the resulting quilt/liner is 24 inches wide. The length is unchanged at 68 inches. 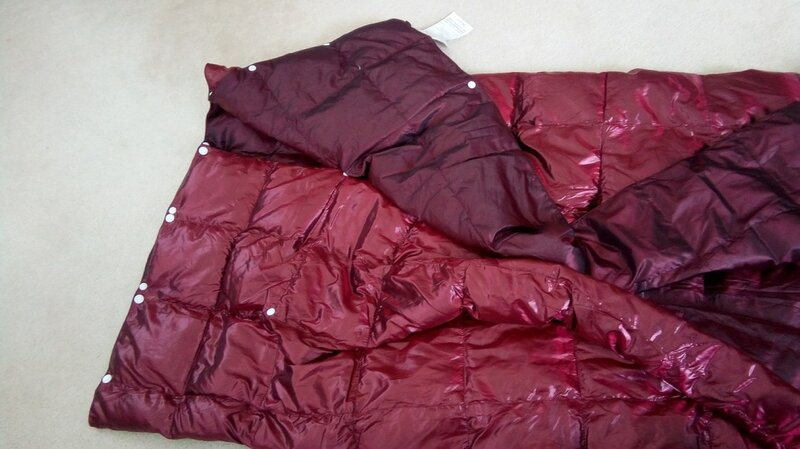 It slips down inside the sleeping bag easily and the side portions are wide enough that it can be tucked in around your body making it all snug and warm. I don't know what the resulting temperature rating would be but I'm guessing this quilt is good into the low 50s so combined with a 40 degree bag should handle the mid to upper 30s anyway.